Glen Wyllin Lodge is an impressive detached family home overlooking the hamlet of Glen Wyllin. Nestling below a wooded bank the extended accommodation has been comprehensively upgraded and modernised to a high finish with Cubbin and Bregazzi and Rumana Swinton design decorations and kitchen. The layout provides four spacious reception rooms, a generous conservatory, ‘high end’ kitchen with Gagganeau appliances and granite tops. Bang and Olufsen wiring throughout, five / six bedrooms, study, en suite bathroom and walk-in dressing room, family shower room and designer family bathroom. Outside is a new four car garage block and an additional single garage with cobbled driveway behind a gated entrance. There is a large enclosed lawned garden with allotment area with raised beds and fruit cage. Viewing is strongly recommended to fully appreciate what this property offers. Follow the TT Course from Ballacraine crossroads to Kirk Michael, turn left at Douglas Road Corner on to the A4 to Peel. Take the first left turn before Glen Wyllin Campsite, follow along the country road where Glen Wyllin Lodge can be found a short distance along on the left hand side. Entrance door with side and wall Light. Coved ceiling. Radiator. Three wall light points. Stained pine wood floor boards. Oak carved fireplace with solid fuel log burner on slate hearth. Two radiators. Shelved cupboard with glass fronted upper door. Engineered Oak flooring. Coved ceiling. Radiator. Oak wood floor. Log burner on slate hearth. Picture rail. Shelved cupboard with glass fronted upper door. Fitted by Cubbin and Bregazzi, this high end Country kitchen has base and wall units. Breakfast bar with light Oak base units incorporating four large pan and crockery drawers. Expansive granite top incorporating Gaggeneau hob with extractor hood above. Other appliances comprise: double oven (steam and convection), Gaggeneau wine cooler, Miele dishwasher, subdivided Belfast sink with mixer tap, fitted full height fridge freezer, wine rack, cream coloured Alpha oven with double hot plates (heats hot water and central heating). Pelmet lighting. Quality tiled surround. Charcoal grey Italian tiled floor. Coved ceiling. Low voltage ceiling lighting. Shelved pantry cupboard with slate effect tiled floor. Glazed uPVC door to outside. Tiled slate floor. Understairs cupboard, coved ceiling. Radiator. Tiled slate floor. Large Belfast sink with mixer tap. Tiled tops. Plumbing for automatic washing machine. Wall mounted radiator. Full height cupboard housing Megaflo hot water cylinder and pressurised system. Coved ceiling. Slate tiled floor. Door to outside. Tiled floor. Two radiators. French doors lead out to the garden. Coved ceiling. Low voltage ceiling lighting. Double rohes units with storage drawers. Fully tiled walls. Shower cubicle, WC and pedestal wash hand basin. Heated towel rail. Coved ceiling and low voltage ceiling lighting. Coved ceiling. Gable windows overlooking the rear garden. Glazed door onto walkway leading to raised patio terrace. Two radiators. Stained pine wood floor boards. Pull down loft ladder access hatch. Two wall lights. Bespoke Cubbon and Breggazzi designed and supplied integrated hanging racks, shelves and drawers. Coved ceiling. Stained pine wood floor boards. Panelled bath with shower attachment. His and Hers vanity wash hand basin. Cupboards with shelving below. Two heated towel rails. Fully tiled walls. Double shower cubicle. Coved ceiling. Electric shaver light point. Tub with central mixer tap. WC. Vanity wash hand basin. Large walk-in shower cubicle. Designer heated towel rail. Black tiled floor and wall tiles. Laminate wood floor covering. Radiator. Vanity wash hand basin with cupboards below. Walk-in closet with vent. Stained pine wood floor. Radiator. Shelved recess seating area. Large Velux roof window over main staircase. Coved ceiling. Loft hatch. Coved ceiling. Radiator. Stained pine wood floor. Coved ceiling. Velux roof window. Radiator. Pedestal wash hand basin. Stained pine wood floor. Coved ceiling. Two radiators. Stained pine wood floor. Cobbled driveway behind the double gated entry. The area provides a turning circle to access the four/five car garage (double electric up and over doors). Power and light installed. Work bench and sink. Gate to the side leads to a slate patio terrace, with enclosed level lawned garden and wooded bank beyond a large allotment area with raised beds and fruit cage. Greenhouse. The well tended front lawn is bisected by a slate path leading to the front entrance door. The borders are shaped and well stocked with shrubs and flowering plants. Electric up and over doors. Power, light, sink and work bench. Currently used for log storage and garden implement storage. Slate patio outside. Power to garage. All mains services are connected. Oil fired central heating. Wired throughout for Bang & Olufsen sound system. 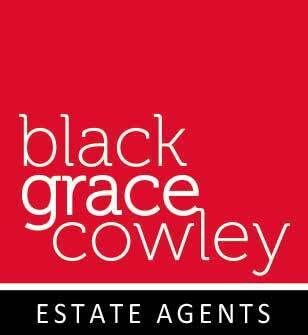 Viewings strictly by appointment through the Agent, Black Grace Cowley.